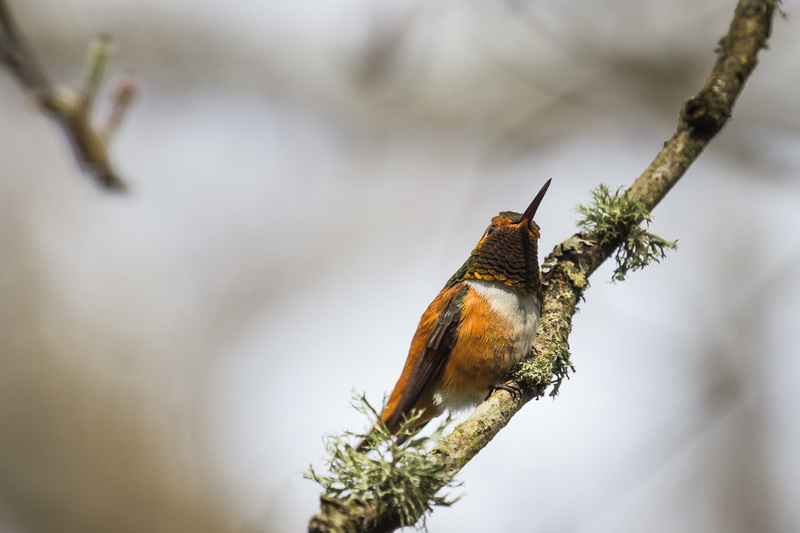 Top: female (left) and male (right) rufous hummingbirds photographed by Mike Yip. Bottom: males photographed by Josh Silberg. 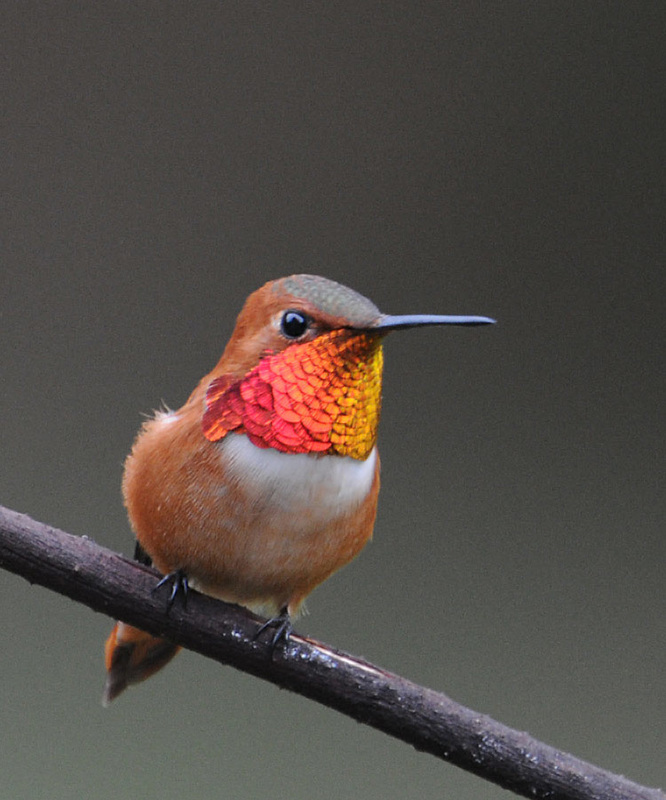 The rufous hummingbird is a bright, talkative, fairly distinctive little bird. 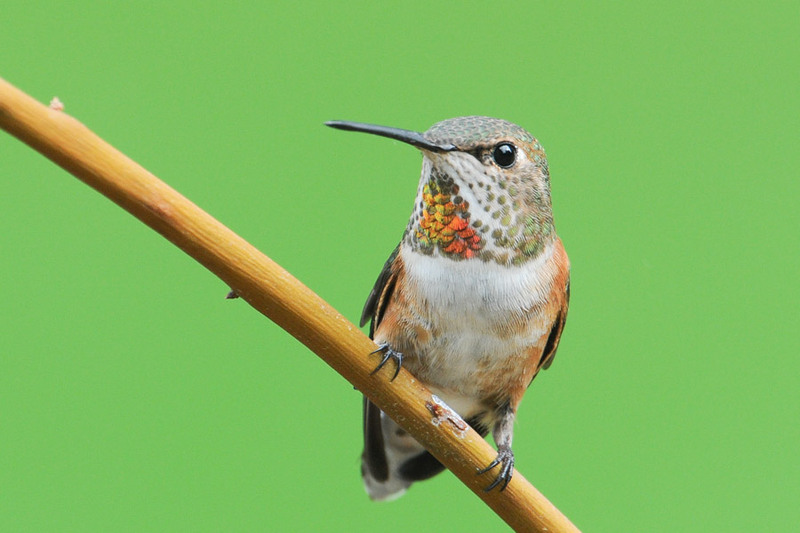 Male plumage is orange-red, sometimes with specks of green, with an iridescent red throat. 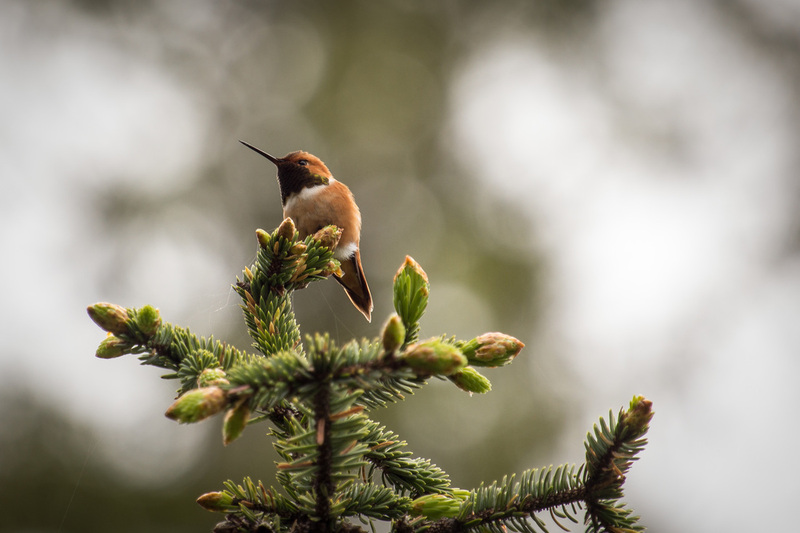 Female and juvenile plumage consists of a green back with orange or rufous (reddish-brown) sides and spots on their throat and tail. This small bird makes a racket (click here to listen) when another bird is nearby, and will dive and dart around the intruder in an attempt to scare it off. This species is found along the west coast of North America from Alaska to Central America at different times of the year. It appears along the Central Coast during the summer breeding months. It is found in a variety of habitats, from open meadows to forests to human-occupied regions like yards and parks. 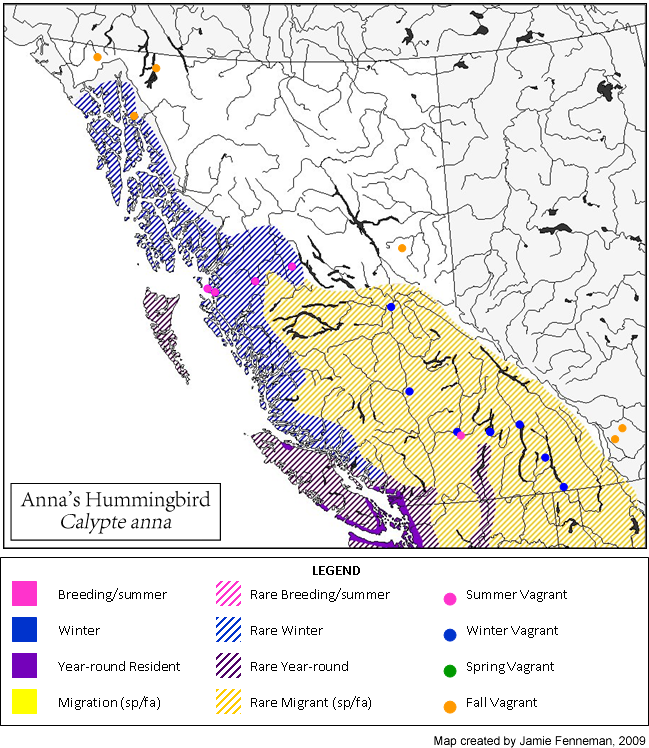 Find more information at the British Columbia Breeding Bird Atlas account here. Non-breeding Anna's hummingbirds (Calypte anna) are only rarely seen on the Central Coast. This species is greenish-grey, with the male easily identified by its bright iridescent red head and throat. The similarly greenish females and juveniles have reddish tail feathers and rumps. 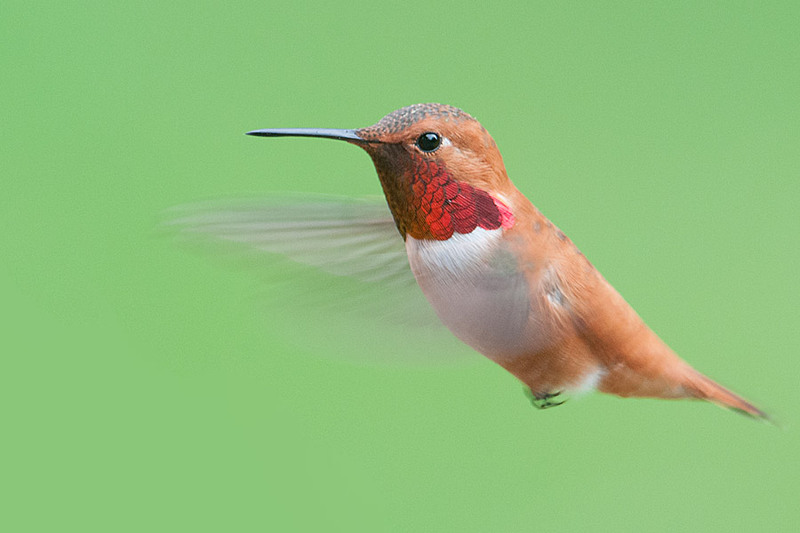 Rufous hummingbirds will often challenge other hummingbirds up to twice their size and chase them tirelessly. They eat nectar and insects. Female (centre) and male rufous hummingbirds. Photos by Mike Yip (left and centre) and Christian Kelly. Dunn, J. L. and Alderfer, J. (Eds.). (2006). National Geographic Field Guide to the Birds of North America. (5th Ed.). Washington, D.C.: National Geographic Society. Pp. 278-279. 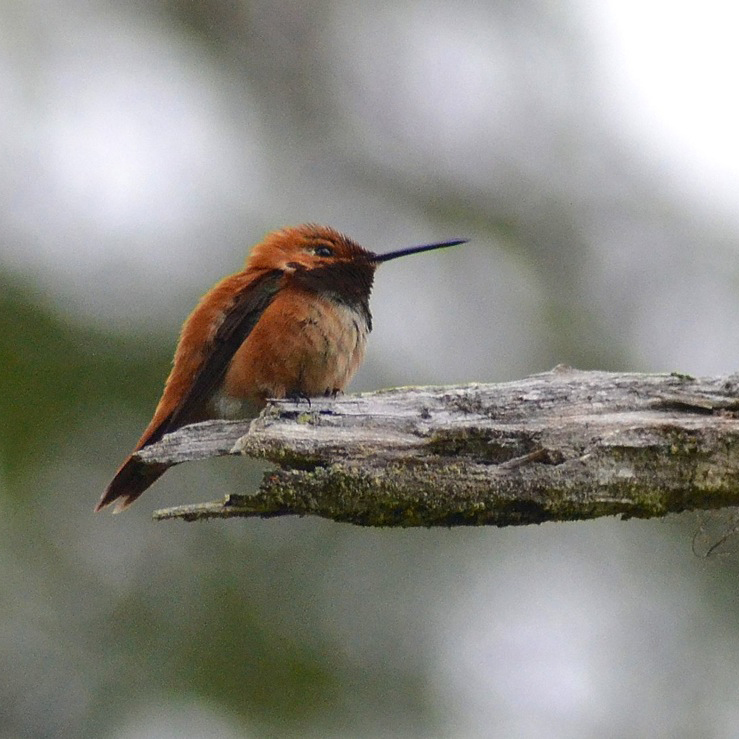 Rufous Hummingbird, Selasphorus rufus. The Birds of North America Online (A. Poole, Ed.). 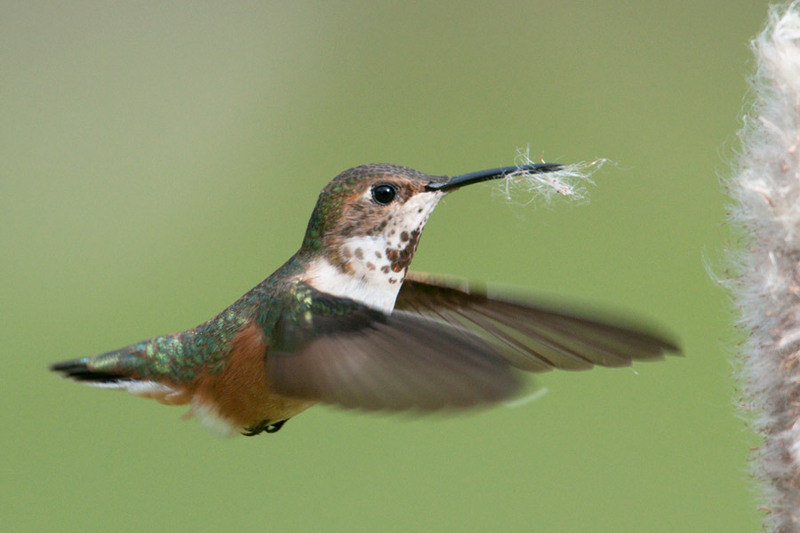 Ithaca: Cornell Lab of Ornithology; Retrieved from the Birds of North America Online. Accessed 27/02/2013.